From 22 to 26 May 2017, the African Development Bank (AfDB) held their Annual Meeting in in Ahmedabad, Gujarat, India, setting a new milestone for Africa-India-Asia relations. Over 3,500 top government officials, business leaders, representatives of NGOs, civil society, as well as members of the academic community and the media participated in the Annual Meetings. Indian Prime Minister, Narendra Modi presided over the opening session on Tuesday in the presence of three African Heads of State – Presidents Macky Sall of Senegal and Patrice Talon of Benin, as well as Vice-President Daniel Kablan Duncan of Côte d’Ivoire participated in the ceremony alongside India’s Minister of Finance, Arun Jaitley, and the Chief Minister for Gujarat State, Vijay Rupani. The Governors (Ministers of Finance, Economy, Planning and, in certain cases, Central Bank Governors) representing the 80 member countries of Africa’s premier development finance institution said in their final communiqué. In line with the central theme, “Transforming Agriculture for Wealth Creation in Africa,” many of the high-level meetings explored how India and Africa can work together order to achieve their shared goal of rural and agricultural transformation. This was the fourth AfDB Annual Meeting outside Africa. The first took place in Valencia, Spain in 2001; the second in Shanghai, China in 2007; and the third in 2011 in Lisbon, Portugal. Busan, Korea, will host the 53rd meeting on May 21-25, 2018. 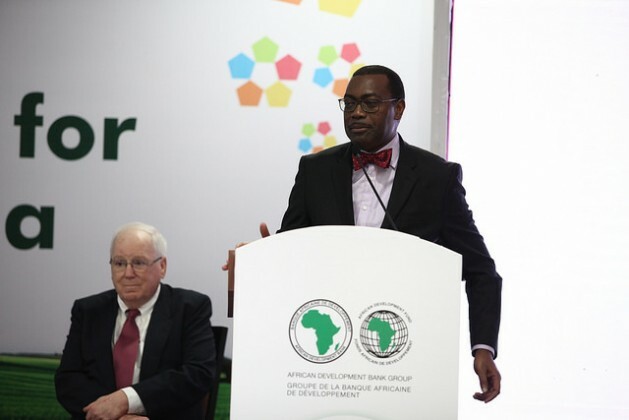 The event concluded with optimism generated by the early successes towards AfDB’s Ten Year Strategy (2013-2022). The twin objectives of the strategy are inclusive growth and the transition to green growth through the AfDB’s High 5 priorities: Light up and Power Africa; Feed Africa; Industrialize Africa; Integrate Africa; and Improve the Quality of Life for the People of Africa. These focus areas are essential in transforming the lives of the African people and are consistent with the United Nations agenda on Sustainable Development Goals (SDGs). On 22 May 2017, the event “Developing Africa’s Grey Matter Infrastructure: Addressing Africa’s Nutrition Challenges” was organised to address the problem of malnutrition. Malnutrition is unacceptably high on the continent, with 58 million or 36% of children under the age of five chronically undernourished (suffering from stunting), and 13 million or 8.5% of children acutely undernourished (suffering from wasting). The event recognised that one of the greatest contributors to economic growth is brainpower, which can be referred to as “grey matter infrastructure” and that a well-nourished brain is key to building it. Jennifer Blanke, AfDB Vice-President, Agriculture, Human and Social Development. The Bank is developing a Multisectoral Nutrition Action Plan, which will focus on ensuring that a well thought out results-oriented plan that recognizes the cross-cutting nature of nutrition solutions can be instrumental for better nutrition in Africa. As Africa’s premier development Bank, the AfDB plans to leverage leadership of African Heads of States, Ministers of Finance, and other key stakeholders in government and civil society to garner the necessary support to increase investments in nutrition and grey matter infrastructure. Gerda Verburg, SUN Movement Coordinator, UN Assistant Secretary-General. The panel concluded that the debate was necessary to ensure that all stakeholders are driven by results to ensure better nutrition aiming at AfDB’s Ten Year Strategy. The discussions focused on the key political and leadership role that can encourage investments in agriculture and nutrition, resource mobilization and the dire situation of some of the African countries that are on the brink of famine. The meeting concluded that the Bank’s leadership role in promoting Grey Matter Infrastructure Development in Africa is a game-changer, providing a much needed venue to convene key stakeholders to bring an end to malnutrition on the continent.